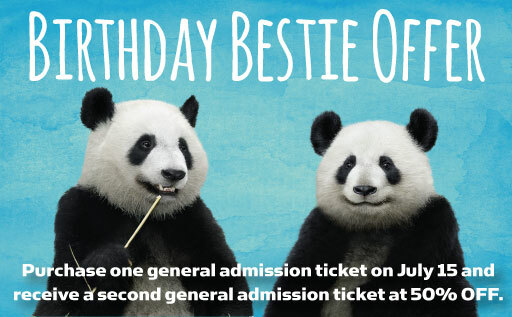 Bamboo Besties Mei Lun and Mei Huan turn 3 on Friday, July 15. Bring your bestie to make it a party! Purchase one general admission ticket on July 15, and mention “I brought my bestie” to get a second general admission ticket at 50% OFF. Each paid admission is valid for one discounted admission of equal or lesser value. Offer valid only at Zoo Atlanta Admissions; not valid online. Discount may not be combined with any other offer or promotion. Celebrate the only giant panda twins in the U.S.! Be here for the big reveal of the twins’ third birthday surprises – 2 p.m. at the Arthur M. Blank Family Foundation Giant Panda Conservation Center!